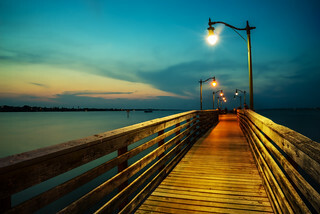 This is the fishing pier the other night at Jensen Beach Florida. I like piers because they take me out of my element and over another, confined yet free at the same time. A little dichotomy for you to ponder before the weekend. Anyway, I thought it was a little funny that the town was named Jensen Beach since most of it is inland. Nonetheless it does have a very nice beach across the bridge. But for me on a nice warm evening this was the place to be.